Penang is world renowned for its appetising food thanks to its diversity in ethnicity, culture, and religion. 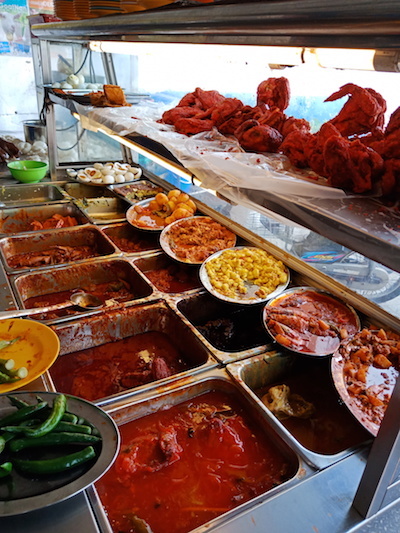 These components present a variety in Penang's street food, hawker food and fine dining restaurants. There is an overflow of options to choose from and every food store has its own “wow” factor. This makes Penang one of the most famous food capital in Malaysia, and in Asia. Penang's cuisines showcase the Chinese, Peranakan, Malay and Indian ethnic mix of Malaysia, as well as some Thai influences. 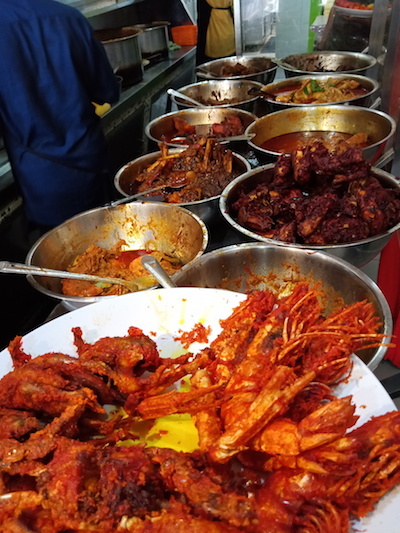 Penang’s famous hawker food, many served al fresco, strongly feature noodles, spices, and fresh seafood. 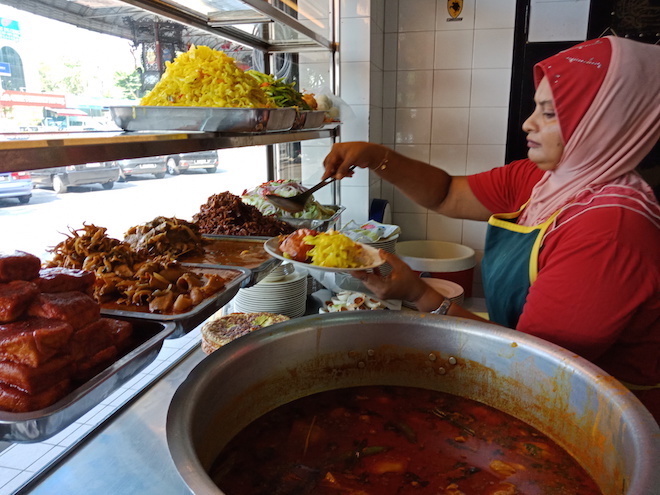 The various street dishes and delicacies of Penang feature a combination of Chinese, Peranakan, Malay, Indian and Thai influences, including (but not limited to) Assam Laksa, Char Koay Teow, Curry Mee, Hokkien Mee, Nasi Kandar, Oh Chien (fried oyster omelette), Rojak, Pasembur and Cendol. Penang is also famous for its traditional pastries, such as the Tau Sar Pneah (bean paste biscuit). 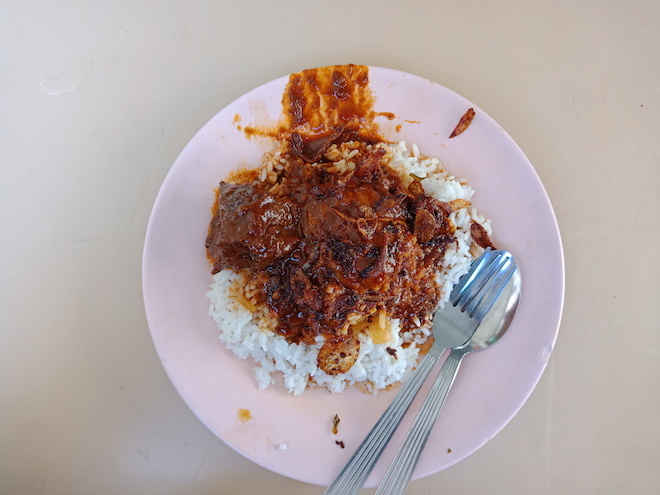 These dishes and delicacies are ubiquitous throughout Penang, and served at very cheap costs at any of the countless roadside hawker stalls, hawker centres and kopitiam (coffee shops) all over the state. 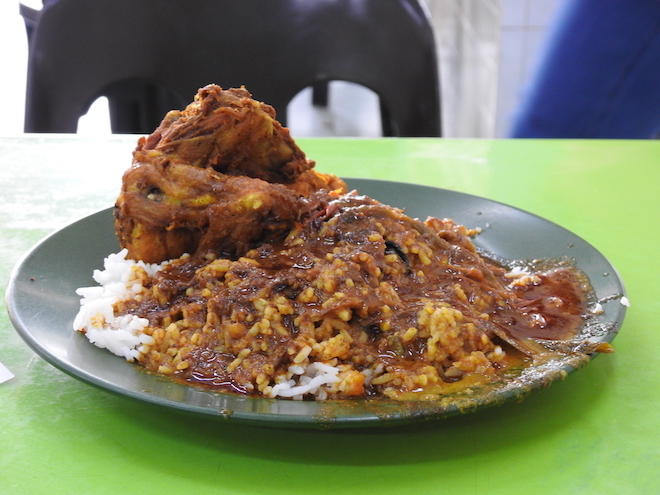 Nasi kandar, which hails from Penang, is a popular Malaysian dish in northern Malaysia. 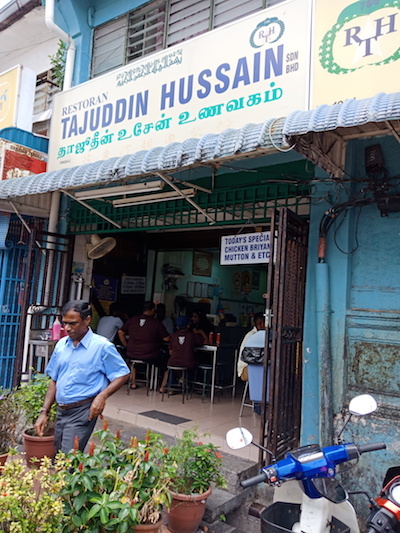 It was brought to Malaysia 70 years ago from India when Tamil-Muslim immigrants roamed the port and dusty streets of colonial Penang, dragging around heavy baskets laden with home cooked dishes and rice. 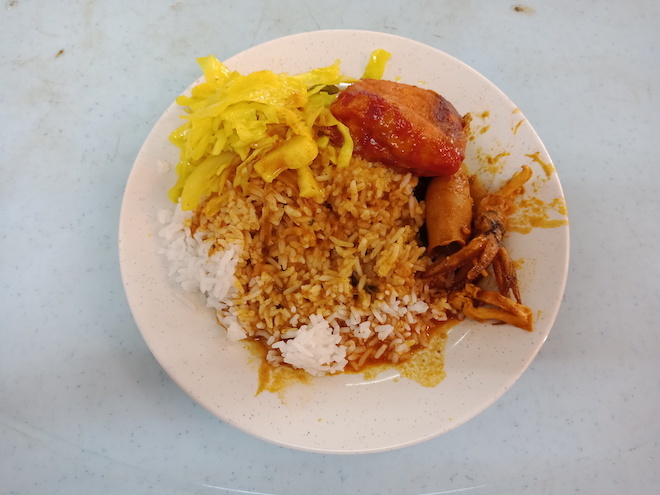 The word nasi kandar, came about from a time when nasi (rice) hawkers or vendors would kandar (balance) a pole on the shoulder with two huge containers of rice. The name held on since, and now the word nasi kandar is seen on most Tamil Muslim or "Malaysian Mamak" restaurants offering rice meals. During those golden days, nasi kandar sellers was known for wearing their dirty sarong, serving meal with cheap utensils accompanied with broken chairs and stools. But today, the image has completely reversed and have now made way for uniformed waiters and waitresses, bright clean restaurant and organised, but worry not! The food still tastes the same if not better. Nasi kandar is a meal of steamed rice which can either be plain or mildly flavoured and served with a variety of curries and side dishes. The rice for a nasi kandar dish is often placed in a wooden container of about three-foot high, passing on a pleasant aroma. The rice is usually topped with eggs, meats and vegetables. The selection has since expanded to include fish roe, okra, quails prepared in herbs and spices, sambal udang (chilli prawns), ayam goreng (fried chicken), cabbage, lamb and mutton. After that the curry sauces is poured over the rice and you can either request for a larger amount of sauce, and this is known 'banjir' (flooding) or you can ask for it to be served separately. Either way this helps open up a palette of flavours thus giving you a happy eating experience. It is extremely rare to see Penangites queue up under the scorching hot sun for a long time. but you apparently can witness this rare occurrence if you visit Nasi Kandar Deen Maju in Penang! This means that this particular eatery have done something right to receive such response everyday. The price here is reasonable and affordable thus the more reasons as to why it is so popular among Penangites. Recently, they have added more seats to accommodate larger crowd. 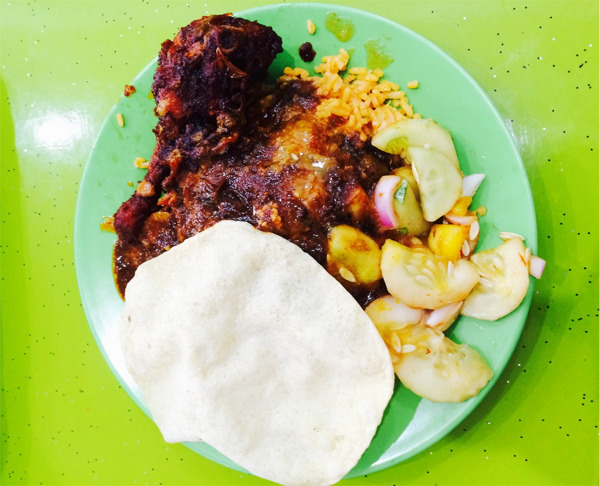 Its popularity is undeniable, so head over soon to experience its exquisite Nasi Kandar! 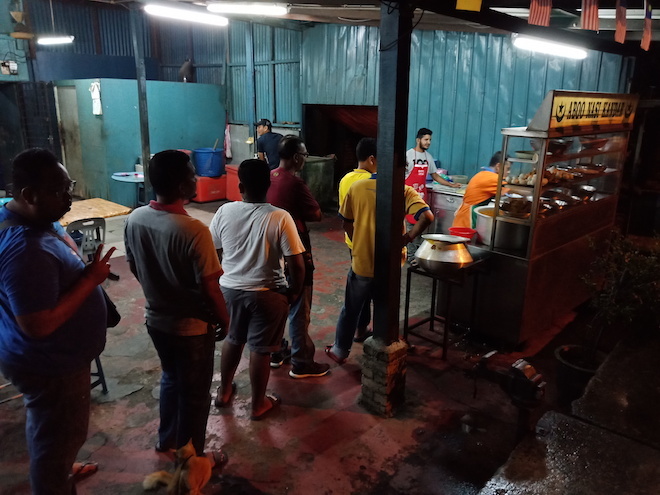 Some call it Nasi Kandar Beratur, and some Nasi Kandar Masjid Kapitan Keling or even the stall’s real name Liyaqat Ali, This place opens from 10pm till late at night and the queue is usually rather long. That delicious plate of nasi kandar is definitely worth the wait! Once a Chinese coffee shop which was later turned into a nasi kandar stall. 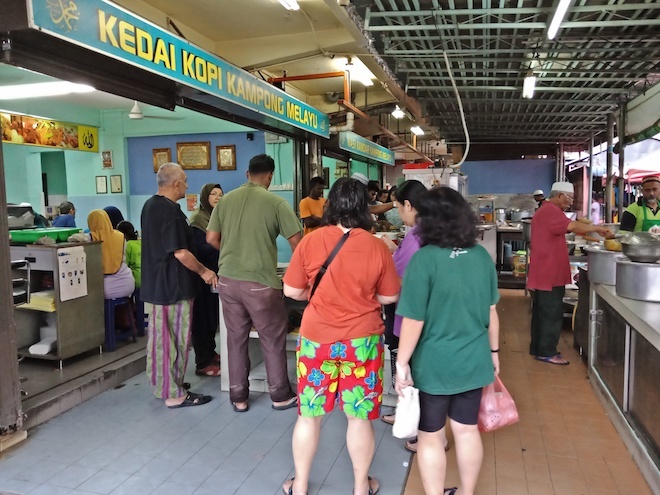 Since then, many have been visiting this eatery for their nasi kandar fix early in the morning. Its thick and creamy gravies were brought down since generation. What a great way to start your energetic morning! During the lunch hour, this nasi kandar place is usually packed with people from different ethnic origins. The way round this nasi kandar place is a little bit different. If you are dining in, the way round is to be seated first and your orders will be taken. For takeaways, you can queue up at the counter. Another pioneer of Penang nasi kandar. Situated under Merlin Hotel (hence the name), foodies will start to crowd around this eatery as early as 8am. A perfect breakfast before work, you’ll probably dash through your workload before realizing it. This little eatery tucked in within the Hans Food Centre was quite a surprise. Opening its doors from 9.30 in the morning, many working Penangites are seen here buying their nasi kandar ‘tapao’ before heading to work . It is famous among its loyal customers for the reasonable price even when the plate is filled with different dishes and assortments. This stall can easily be found as it is near Dato Keramat Market and Masjid Datuk Keramat. 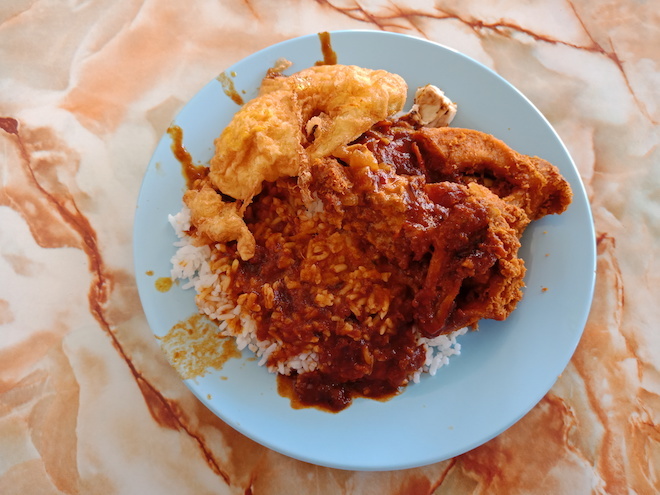 Penangites can satisfy their cravings for Nasi Kandar Ceri as early as 7am. The thick curry is sure to spice up a new day! Besides that, there is ample parking spaces for your convenience. One of the legendary nasi kandar in Penang much loved by Penangites. 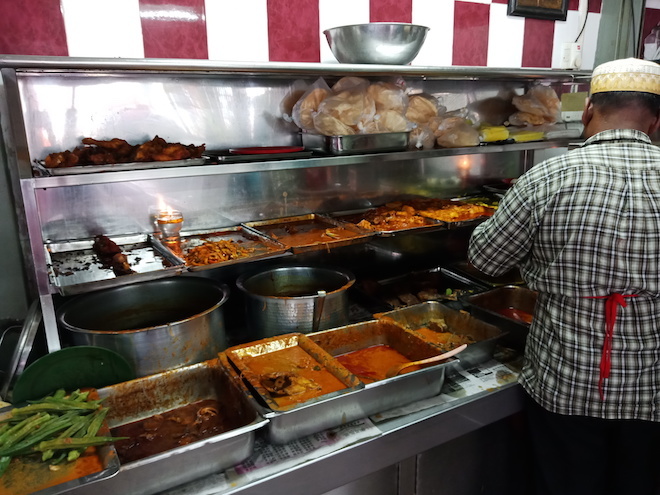 Although they have been operating since 1907, they have maintained its wholesome flavours, proving that this eatery is a legit must-visit where you can experience the authentic taste of its nasi kandar. 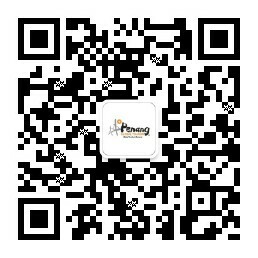 They have also upgraded their restaurant with air-conditioners for the comfort of their customer. As you can see, the uniqueness of this stall is its three-wheel cart. 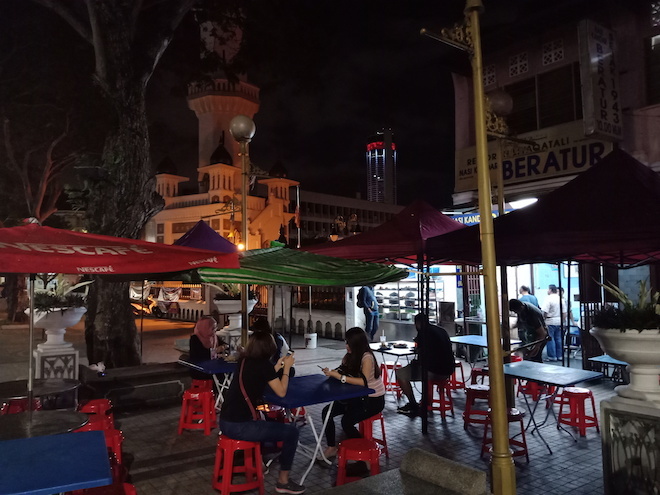 The open air surrounding gives a calm ambience as you enjoy a delicious plate of nasi kandar . Sitting on a small chair under the tent emphasizes a nostalgic feel as its reminiscence how an old school nasi kandar used to operate back then. This small stall can be found under the fly over near Butterworth (Penang Sentral). This friendly uncle will greet you by asking what dishes you’d like and the amount of rice you want. Don't be shocked if you see people queueing up as late as 4am because this particular stall starts operating at 10pm till the next morning, depending on the availability of their dishes. There’s always a queue at Nasi Kandar Deen throughout its operating hours. Not the fanciest shop front, don't judge the taste of nasi kandar by its stall. Operating round the clock, this place never disappoints. Situated near to Penang Hill, this particular restaurant serves hot and delicious nasi kandar throughout the day. Always filled with Penangites during lunch, head over early before they run out of dishes. A well-known nasi kandar eatery among Penangites in the mainland, This nasi kandar has a unique operating hours – starting from 11pm. Hungry and it’s late? Nasi Kandar Pokok Ketapang it is!